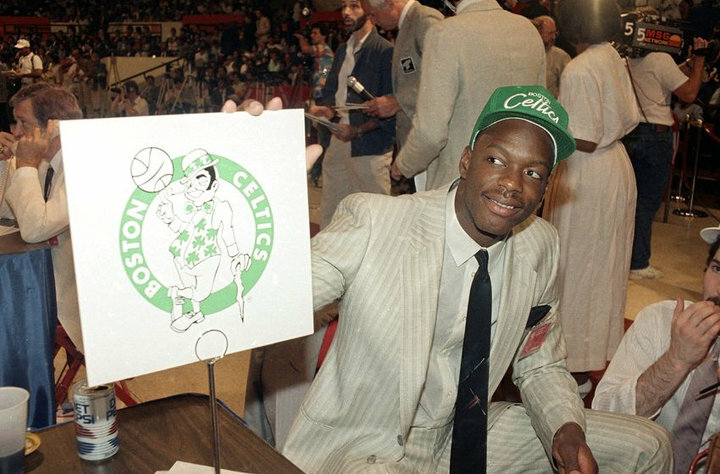 26 years ago this week Len Bias became the 2ndoverall pick in the 1986 NBA Draft. A consensus All-American at the University of Maryland, Bias was headed for super-stardom, having met with Reebok officials regarding a multimillion-dollar endorsement deal the very night he was drafted. After meeting with Reebok brass and representatives from the Boston Celtics—his new NBA team—Len and his father flew home to Washington D.C. Eager to celebrate with his college teammates, Len returned to campus for the last time. 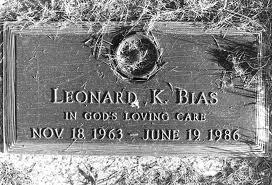 26 years ago this week Len Bias was pronounced dead at Leland Memorial Hospital from cocaine-related cardiac arrest. Stories regularly appear about Bias on the anniversary of his death, particularly last year, the silver anniversary of his tragic overdose. Most if not all cover typical narratives of lost promise, what might have been, and those influenced by his legacy. Frequently, articles also include a feel-good excerpt about Lonise Bias, Len’s mother who now lectures school-aged youths about the dangers of drug abuse. Lonise, Len’s college coach Lefty Driesell, and others still steadfastly regale the press with anecdotes of young people claiming that Len inspired them to kick their drug habit. Lonise has often said that she is pleased her son was able to do “more in death than he did in life,” by serving as a deterrent and cautionary tale for other potential users. While there is no doubt that Len’s untimely demise has helped select persons particularly moved by the circumstances of his death, the story does not end there. Lonise is surely right that Len has been able to do more in death—as a symbol—than he was able to accomplish in life. As a symbol, Bias served as a primary vehicle in building the modern War on Drugs and its ugly stepsister, the Prison-Industrial Complex. In this respect, Len’s legacy and the circumstances of his death became central for their reverberations amongst policy circles on Capitol Hill in the summer of 1986. Thomas P. “Tip” O’Neill—then Speaker of the House—returned from July 4threcess a man on fire. “Write me some goddamn legislation,” he demanded. In the 1984 election, Republicans had successfully accused Democrats of being soft on crime. Not in 1986 thought O’Neill. We have to beat Republicans to the punch here, if we move fast enough, we can take the issue away from the White House. Having spent his recess at home in Boston (where Bias had been drafted), O’Neill understood the high-profile nature of the Bias tragedy offered a rare political opportunity. 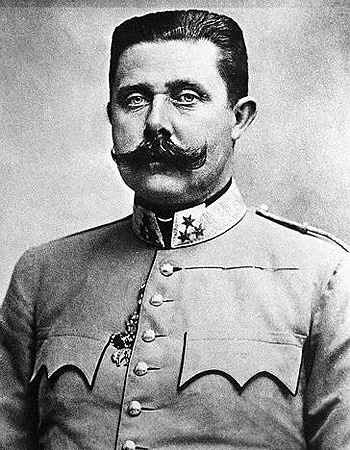 He also understood that the people wanted blood. “Law and Order” makes for Successful Sitcoms and Bad Politics. In order to steal the issue and score a victory for Democrats at the height of Law and Order political hysteria, the “goddamn legislation” needed dramatic new initiatives; attention grabbers letting constituents and the judiciary know that elected officials were serious about addressing the scourge of crack. Nevermind that Bias overdosed on extremely high-grade, pure cocaine and was not a first-time user. Early reports garbled this reality and the incident quickly became conflated with the crack news media bonanza. Serving as counsel to the U.S. House Committee of the Judiciary, Eric Sterling had a front-row seat to watch the tragedy of the Bias affair compounded by further tragedy. 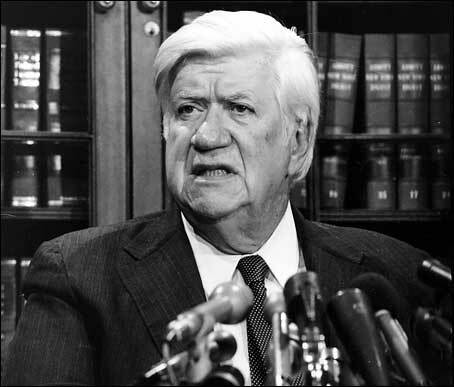 As he explained to PBS Frontline: “In 1986, the Democrats in Congress saw a political opportunity to outflank Republicans by ‘getting tough on drugs.’” As Sterling argues, Tip O’Neill knew that for Democrats to take credit for any anti-drug program in November elections, the bill needed to get out of both Houses of Congress by early October. This required action on the House floor by early September, which forced committees to rush their work to completion by August recess. Given that O’Neill’s idea to ram through anti-drug legislation came in early July, the law-writing committees were given roughly one month to develop the ideas, to write the bills, and to get feedback from relevant government agencies and any other non-governmental organizations, as well as the public at large. In the 100-meter sprint to legislation, one idea gained particular traction for its appeal as “tough on drugs.” This was the creation of mandatory minimum sentences in drug cases. Despite being removed from federal law in 1970 after extensive and careful consideration, mandatory minimums quickly resurfaced as viable policy. Rather than debate the merits of mandatory minimums as leaders had in 1970, mandatory minimums were rushed through the committee and into law with little thought or discussion. No hearings were held, no “experts” called for testimony, not even judges or the Bureau of Prisons were consulted. To make matters worse, the minimum sentencing structure proposed bounced back and forth between the Democratic controlled House and the Republican controlled Senate as each side upped the anti. Jockeying for political advantage, both parties saw to it that sentencing built into the legislation became increasingly draconian, while weight thresholds intended to trigger minimum guidelines diminished to frighteningly low levels. On October 27, 1986, House Resolution 5484, the Anti-Drug Abuse Act of 1986 was officially signed into law as the illogical extension of one man’s overdose. Explicitly intended to target large-scale traffickers, the legislation sloppily resulted in the systematic warehousing of low-level dealers and small-time drug addicts. Weight thresholds for mandatory minimums began at 5 grams (weight of 5 packets of artificial sweetner), and escalated to 50 grams (weight of a candy bar), 500 grams (the weight of two cups of sugar), and 5,000 grams (weight of a lunchbox of cocaine) respectively. 5 grams triggered a 5-year sentence without parole while 50 grams of crack commanded a 10-year bid, also without parole. Curiously, to trigger a 5-year minimum with cocaine, offenders would need to be caught with 500 grams on their person. This, unceremoniously, has become the 1/100 discrepancy drug-policy reformers rail about. The same 1/100 discrepancy amended by the Fair Sentencing Act of 2010. The problem here—in addition to the racially driven disparity between crack and cocaine sentencing—is that 5 grams, 50 grams, even 500 grams is simply not a lot of product. Large-scale traffickers organize shipments of drugs totaling tons—many millions of grams—filling tractor-trailers, airplanes, fishing boats, and now, even retro submarines. As such, a vast majority of arrests target low-level dealers and addicts. In 1990, Congress called upon the U.S. Sentencing Commission to study the impact of mandatory minimum sentences. In 1991 the Commission found that the disparity in sentencing between white and black offenders had increased substantially. The Commission also found that all defense lawyers, and nearly half of prosecutors queried had serious problems with mandatory minimums. In 1995, LA Times columnist Dan Weikel dropped a bombshell which clearly-defined the legacy of both Len Bias and the Anti-Drug Abuse Act of 1986, referred to in some circles as the “Len Bias Law”. In his article, Weikel laments the incomprehensible reality that “not a single white, records show, has been convicted of a crack cocaine offense in federal courts serving Los Angeles and six Southland counties since Congress enacted stiff mandatory sentences for crack dealers in 1986.” More troubling, this statistical anomaly existed in 17 other states, and many major cities including Boston, Chicago, Miami and Dallas. In New York, perhaps the original epicenter of the crack boom, only three white offenders had been prosecuted in federal court. As we well know, this is not because offenders of all stripes were not being prosecuted. In fact, the zealous prosecution of nonwhite offenders under the first 20 years of mandatory minimums resulted in a 527% increase of the federal prison population, more than half of which consist of drug offenders. Recently, the work of Michelle Alexander has precipitated renewed discussions about the effect of mandatory minimums and the lifelong effects of felon status. The first round of mandatory minimum sentences were enacted in 1951, and repealed nearly 20 years later, with bipartisan support. 26 years after the death of Len Bias and the passage of the Anti-Drug Abuse Act of 1986 “bipartisan” is not a word we hear often, but, here’s to hoping….. I hadn’t thought of this point, thanks for bringing it up. I’m thinking in particular of that NIDA funded study that claimed ecstasy puts holes in your brain. It was later found they made a bunch of mistakes in the study, including giving the primates an entirely different drug than MDMA. More research on drug addiction is a good thing but not if it is backed by a war agenda. That said, I have liked what I have heard from the current NIDA director. She sounds neutral and her perspective doesn’t sound completely driven by drug war ideology. Thank you for the thoughtful comments. You are right that we have not yet tackled the full ramifications of the Anti-Drug Abuse Act of 1986. Moreover, historians have only scratched the surface with regards to changes wrought by the advent of crack and the subsequent crack panics which ensue in the summers of 1986 and 1988. Ideally, my dissertation will in part, address these issues. I will also revisit said issues in future posts. It is important that political elites are not given too much credit (or fault) for pioneering this legislation. As I will argue next month, many grassroots organizations in areas most adversely effected by open-air crack markets rallied around similar talking points which we see in the eventual Anti-Drug Abuse Act of 1986–namely demands for increased enforcement, increased foot patrol, harsher sentencing, and federal minimums.